This traditional executive home in Franklin’s desirable estate section of Cedarmont Valley is immaculate inside and out. The scenic acre lot has gorgeous views and the exterior living spaces include a beautiful pool. This traditional executive home in Franklin’s desirable estate section of Cedarmont Valley is immaculate inside and out. The scenic acre lot has gorgeous views and the exterior living spaces include a beautiful heated, saltwater pool. 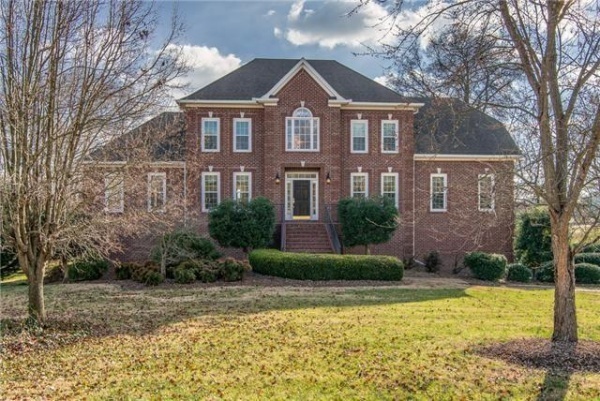 With six bedrooms and four full and one half baths, you’ll find plenty of room for a large family — and that includes an extended one if the need arises. A lower level in-law/teen suite comes complete with a full kitchen and separate entrance. In total, this two-story, 5300-square-feet home has it all and is well priced at $740,000. The inviting two-story foyer opens to the formal living room that can easily serve as a home office or study and the bright formal dining room with crown molding, wainscoting and a beautiful crystal chandelier. French doors from the dining room open to the modern white kitchen with granite countertops, stainless appliances and a lovely view of the back yard from the large breakfast area. The center island has space for several bar stools and extends the already abundant prep and serving space. The kitchen opens to the informal den which has the same hardwood floors found throughout the main floor living areas. A wall of windows and glass-paned French doors flood the room with natural light which will likely be the family’s favorite gathering spot. Prepare to keep the popcorn popper busy once you discover the main-level media room that features an enormous projection screen and surround sound system. Sports fans and movie buffs will compete for viewing time in this comfortable space. The main-level master bedroom is majestic, with a custom trey ceiling and plush carpeting. The master bath, with its beautiful view from the sunken tub, has matching his-and-her vanities, a separate water closet, a custom tile shower and custom tile floor. Each of the remaining bedrooms has been freshly painted in designer colors. One has a private bath and walk-in closet; another is large enough for a sitting area and has a private entry to the main hall bath. The large lower-level living room, fireplace and full kitchen have access to the pool and back yard. The living room has built-in bookcases and wide-planked light wood floors. The adjoining bedroom is huge and has a private full bath. You can take in miles and miles of uninterrupted views of beautiful Williamson County countryside from the large main floor deck that looks down at the pool below. The pool area, with its cabana-like large covered patio and tiered pool decking, provide plenty of space for summer swim parties and entertaining. Established Leyland cypress trees just beyond the pool decks provide a natural screen for extra privacy. The established landscaping leaves little to do beyond move in and enjoy. There’s also a new air conditioning unit and new windows. This home has garage parking for three vehicles. With Cedarmont Valley’s convenient location just south of Murfreesboro Road off Arno Road, commuting is easy with quick access to I-65. The charm of downtown Franklin and amenities of Cool Springs are just minutes away. This home is zoned for Williamson County’s Trinity Elementary and Page Middle and High schools. For more information or to arrange a showing, contact listing agent Georgia Mascali with Benchmark Realty at 615-371-1544.